Well mum was not purring on Sunday as she was not happy. Less than a week into our new kitty condo tower, and Derby messes it up. That boy is a yakker! Mum cleaned it up, but from this top, Derby also launched it over the side and unto mum really nice chair. OHHHHH DEAR. Mum was really not happy and she was in the middle of cooking so couldn't get to the cleaning right away. Mum did pull out the cleaner stuff and got the stuff off, but then couldn't sit her to watch fevvers on Sunday afternoon. What? You got a problem with me? Down to the last game of the regular season. The Pack - played Da Bears, some freaky plays during the game. First we got our QB ARodg back playing. A fumble by ARodg, that just sat on the field until someone yelled at them and they picked it up and got a TD. It was back and forth all game, even in the last seconds Da Bears were looking to score but we caught it and ran out the time. NFC North Champs. Phew, now on to the playoffs! The Broncos -cruised right along playing The Raiders. Mr Peyton did his usual wonderful QB job and threw 4 touchdowns, set a single season passing yards record of 5,477 yards and 55 TD passes. Then Mr Peyton took the second half off!. The team scored a record number of points for the year at 606 and they are the firsted team to ever do that. They get next weekend off to start the playoffs. We get to start a new year this week. Stay tuned! Quiet day here but lots and lots of sun puddles. Plus it is all warms outside and mum went outside without her ear muffins on and didn't get all cold. Plus the snow on the driveway is all clear now of snow. We are continuing to love our new condo tower. Today we were practicing our dangles. This is that big box now empty, mum had taken the stuff out to work with. Yep mum you got all of the parts out, now put the thing together. Yep, some assembly required. Derby even decided it was a good place to nap on the empty box once mum put the pillow up there. So what did mum have to assemble? Our very own kitty condo tower! Wooohoooo. Mum you done good for us. She has it sitting right next to her reading / fevver watching chair. So we can go directly to the tower to sit, or still sit on the chair. Move to the chair and jump on the tower. We were bizzy checking it out even before mum had it all put together. She said it was simple to do, all the parts were clearly different, easy to identify what part was needed next. Even the one tool you needed was included. So in short order mum had it all put together and moved it next to her chair. The we could really start checking it out. Mum sat down in her chair so she could watch us. Ducky deciding the first place to hang out was the little cube, which has porches on both sides for access. Derby decided he wanted to be at the top of the tower, so jumped up there right away. You can see us in our respective first spots. 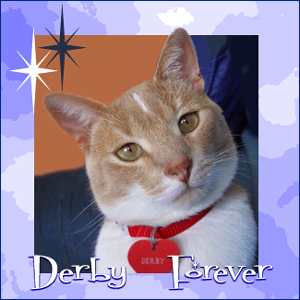 However, as time went on Derby came down from the top. Ducky took the top spot with a flying leap. Nice view both to the outside and back inside the house. Now with the thingy gone from outside, we have a grate place to watch outside and not just be at the snow level. WE GIVE YOU KITTY MUM OF THE YEAR! Our trees on Sunday after the snow storm. 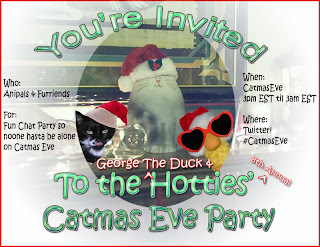 Plus if you are looking to connect with some of your fur pals today, The Hotties and George the Duck are hosting their 8th annual Catmas Even on line party. 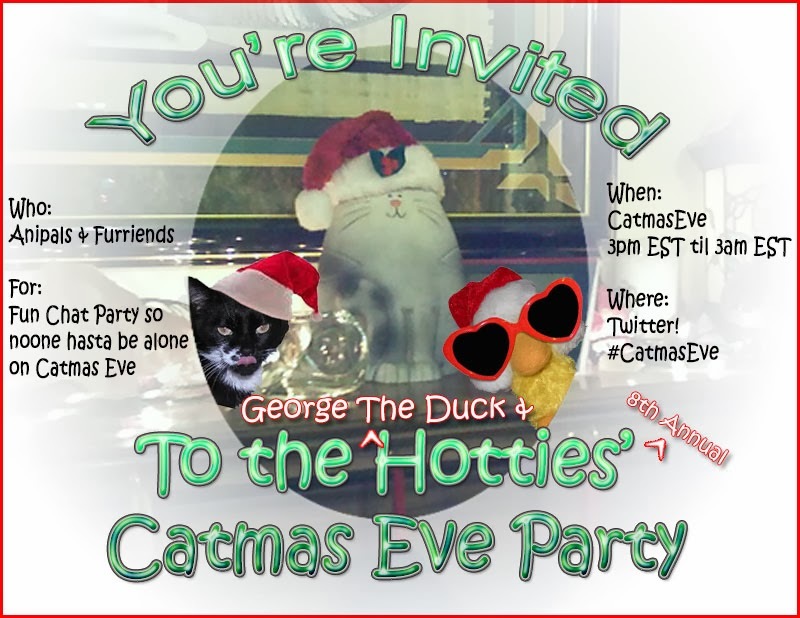 It will be on a chat program called Chatzy and Twitter if you are a tweeter. So stop in, even if only for a bit. We love catching up with furiends, old and new. Blessed are the PURR in Heart! Then we are truly blessed! Mum says we both have been purring lots lately. Maybe becuz we expect Santa Paws to stop by soon. Mum finally relented and helped us unwrap our Secret Paw prezzies this weekend. Our partners was Laila and Minchie, from south of the border in Illy-nois. 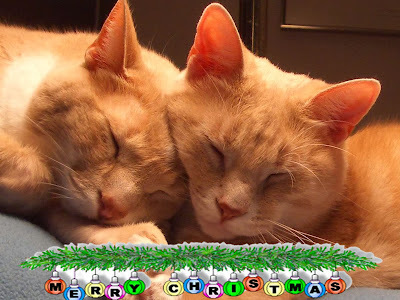 All sorts of little packages and with kittie pictures dressed up for the holly-day. A new nip nanner!. Mum just got us a new nip carrot, so this one will go into the cupboard for the future. The giant economy size of Greenies! We have never see a package that size, like about two or three times the size of a regular package. Toys with fevvers!. Derby checks them out, but it is Ducky that actually plays with them. Derby is an old geezer cat, he doesn't play as much anymore. Mum got a few goodies too. Sweets to eat and little things to mark her spot where she is in her books when she reads. All with kitties on them! 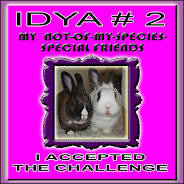 Thank you so much Laila and Minchie. You did a furry good job in picking out good stuff! Be ready to find out what is in our super big box on, well Boxing Day! That would be the day after Christmouse for those who didn't know. The Pack - played the gang from the Steel City. The last time these two teams met was in the Stouper Bowl in 2011 which the Pack won. Today however it was the Steel guys turn. It was a close game and mum thought they might go into overtime. But if Da Bears win tonight, The Pack can close out the season next week at Da Bears, then go home to rest up and heal. The Broncos - They beat them Texas guys on Sunday.Mr Peyton set a record of number of touchdown passes thrown in one year at 51. Plus he still has a game to go yet this season. Plus the team has now clinched their AFC West and will get a bye for the first round of the playoffs. 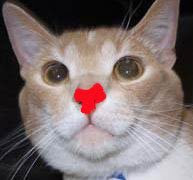 Woohoo, the last weekend before Christmouse! We are snug at home, shopping done. Mum went out early today to get foods and books from the library. She even saw the after-math of an accident at one of the main places she had to drive through. Thankfully she is home all safe. Expecting lots of the white stuff overnight, so good that she is home and we all have foods to eat. Mum is doing some washy stuff including a bit more tidying in the dungeon. Little by little it is looking better. We are snuggling and have decided the bestest place to snuggle in on the chair where mum keeps here warm outside clothes. Yep, we can both fit here. My sweetie Dora and her mum came through for us and mum with goodies.Just in time for Christ-mouse! Yes mum I see that it has Dora's address on the package, hurry up and open the package. Yep, we got everything out of the package, so what did we get? UK cat toys that have the Union Jack on them. Treats that we can't get here in Mericky. Something for mum and it is filled with choc-o-lats. Plus a pin from their favorite feetball club, Chelsea. Mum says that is what gets called sock-her her in Mericky, they are pretty good team. I made a grab for the nip mousie, it is MINE! Besides the sweets, mum got a cute pad of sticky notes with kittie pictures on the side. Almost too cute to use. So at least we got something cool to play with before the big day. Plus it can keep us entertained while mum is off day hunting and going to parties for her day hunting gig. She doesn't stay super late. Long enough to say hello, get some goodies to eat, then come home. Our Secret Paw Package is HERE!